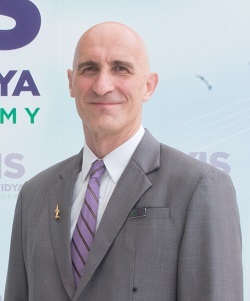 Dr. Artur Gorka, an associate professor of Mathematics from Erskine College in USA, visited KVIS on a sabbatical leave and taught mathematics to KVIS students for an academic year from May 2015 to August 2016. Dr. Artur is an american with Polish origin, obtained his MSc from the Nicolaus Copernicus University in Poland and later a PhD from Clemson University in USA. Dr. Artur Gorka speaks fluent Polish, English and Russian. He was learning Thai and has been making a good progress. He impressed most of the people who work with him for his love of his teaching of Mathematics and the love for his mother. It was a common sight to see Dr. Artur Gorka video conferencing with his mother in Poland after his teaching periods at KVIS. Being a judo black belt, he successfully led a Judo club at KVIS. 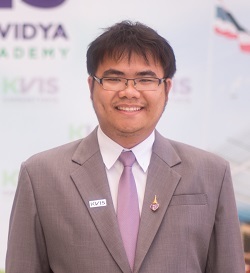 One of his noteworthy contributions to mathematical research at KVIS was to advise students on a research project titled “Fractals in Thai Culture”. opportunities to lecture students from various high schools preparing them for the Mathematics Olympiad. 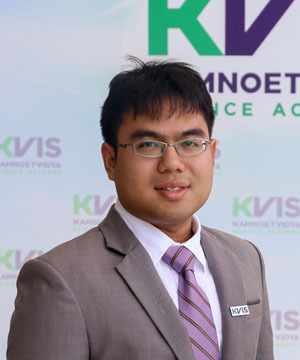 Since taking an opportunity to work at KVIS as a mathematics and computer science teacher in May 2015, Wasanont Pongsawat has received numerous great teaching experiences and also broadened his perspectives through opportunities provided by KVIS. 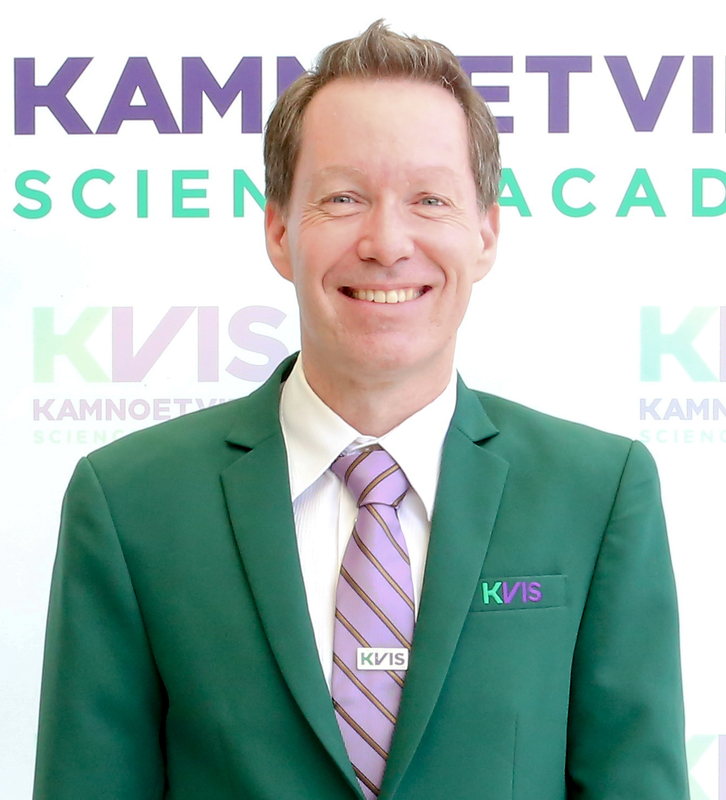 He participated in a professional development program with one of our partner schools, the North Carolina School of Science and Mathematics in the US before KVIS was officially opened. Not only does he enjoy teaching his classes, but also tutoring to KVIS students in Algebra for the Mathematics Olympiad Camp. 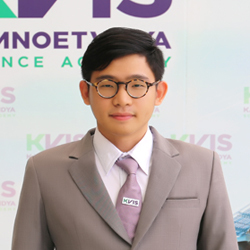 Wasanont Pongsawat played an important role in enabling the five KVIS students to receive 4 silver and 1 bronze medals in the 13th Thailand Mathematics Olympiad (TMO) in 2016. 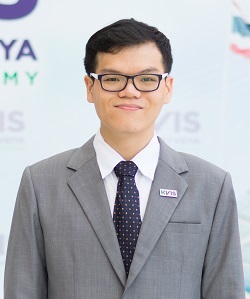 He is also the Vice-Leader of the Mathematics Olympiad regional center in the eastern part of Thailand at Burapha University, Chonburi Province. Guntaphon Tassanasophon has an extensive background in mathematics. 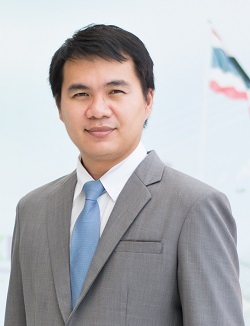 He graduated with a BSc in mathematics in 2013 and an MSc in mathematics in 2016, both from the Department of Mathematics and Statistics, Faculty of Science and Technology at Thammasat University. While he was studying for his master’s degree, he presented his research in various conferences. 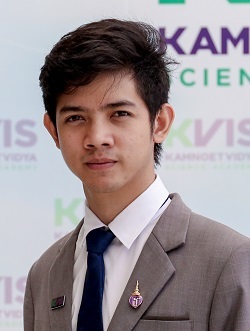 In 2015, he presented his research at The 11th IMT-GT International Conference on Mathematics, Statistics and Its Applications (ICMAS2015) in Pattaya when Thammasat University was a host. He later presented his work at the International Conference on Applied Statistics (ICAS2016) in Phuket. 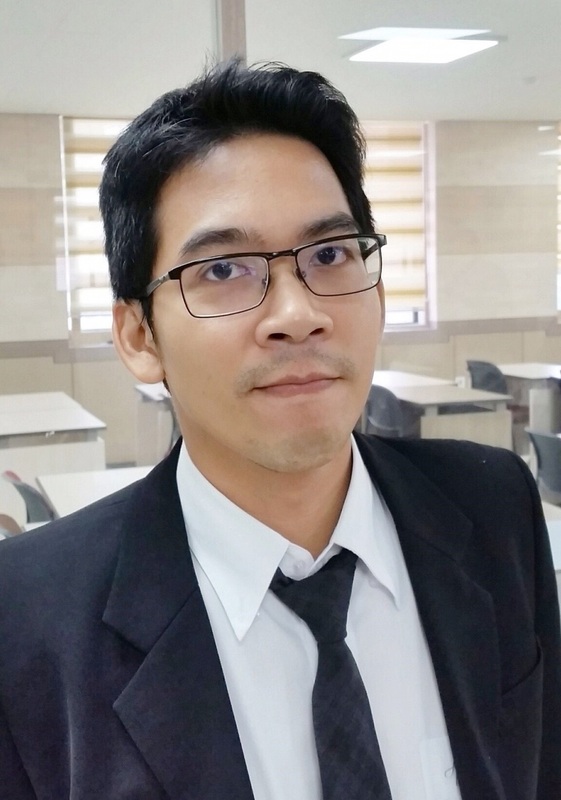 His paper was accepted for publication in The Thai Journal of Mathematics, in the special issue for the 11th IMT-GT International Conference on Mathematics, Statistics and Its Applications (ICMSA2015). He was proud to be chosen to join the Mathematics and Computer Science Team at Kamnoetvidya Science Academy in 2016. Thanaporn Thanodomdech graduated with a BSc in mathematics with honors in 2013 and completed her MSc in mathematics in 2016, both atChulalongkorn University. While studying for her master’s degree, she received the scholarship from His Royal Highness Crown Prince Maha Vajiralongkorn to commemorate the 72nd anniversary of His Majesty King Bhumibol Adulyadej. Her major fields of study are Probability Theory, Statistics and Stochastic Process, especially the Strong Law of Large Numbers. 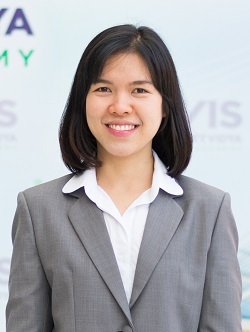 Along side her studies, she has participated in several academic activities; such as the 20th Annual Meeting in Mathematics at Silpakorn University in 2015, and the Thesis and Dissertation in Progress Seminar–MATH at Chulalongkorn University in 2015. 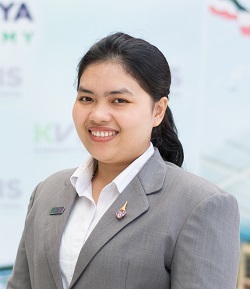 Before joining the Mathematics and Computer Science team at Kamnoetvidya Science Academy in September 2016, she gained teaching experience as a mathematics instructor at the Science-Based Technology Vocational College in Chonburi Province. Dr. Myra Halpin from the North Carolina School of Science and Mathematics (NCSSM) came to work with the KVIS Chemistry Department in 2015. She also hosted the visit of two KVIS chemistry teachers who travelled to NCSSM to learn techniques in teaching chemistry in 2015 and 2016. 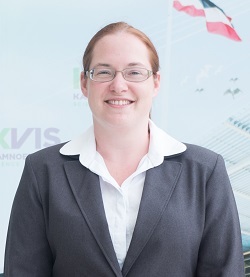 Additionally, she supported two teams of KVIS students participating in the ‘Conrad Spirit of Innovation Challenge’ at NASA’s Kennedy Space Center Visitor Complex in 2016. Dr. Suranan Anantachaisilp earned her BSc in Chemistry with honors under the Distinction program from Mahidol University in 2009. 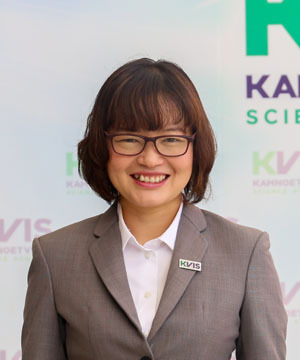 She studied under the Cotutelle Doctoral Program, graduating with a PhD in Science from the University of Technology Sydney and also receiving a PhD in Physical Chemistry from Mahidol University in 2015. She has been name on the Chancellor’s List in recognition of exceptional scholarly achievement in PhD research at University of Technology Sydney as well as received Distinguished Thesis Awards at Mahidol University. 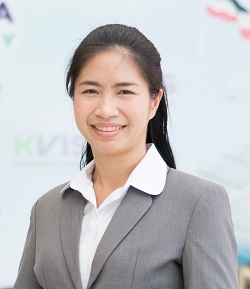 During her PhD studies, she served as a teaching assistant in the Material Science & Engineering lab sessions at the University of Technology Sydney in 2012, and also in the Integrated Laboratory Techniques in Chemistry I at Mahidol University International College in 2014. 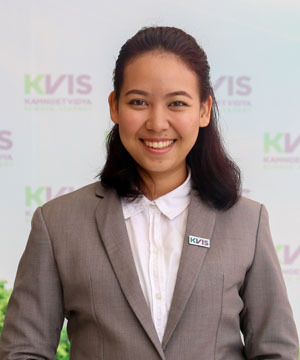 Prior to joining KVIS as a chemistry and earth science teacher in 2015, she worked as a chemistry teacher in the Chemistry Summer Credit Recovery at Mahidol University International Demonstration School. Dr. Suranan Anantachaisilp holds several publications and earned many scholarships, including the Senior Project Grant from the Young Scientist and Technologist Programme, NSTDA. She also received The Royal Golden Jubilee scholarship, as well as a scholarship from the Australian Research Council for her PhD at Sydney. During her bachelor’s degree, she earned a four-year scholarship from the Science Achievement Scholarship of Thailand. Additionally, she received the Outstanding Oral Presentation Awards in Pure and Applied Chemistry International Conference in 2009 as well as the Outstanding Poster Presentation Awards at the 4th Congress on Science and Technology for Youth in the same year. In 2015, she received the Outstanding Oral Presentation Award in RGJ-Ph.D. Congress XVI. Dr. Suranan Anantachaisilp also presented her research in many international conferences such as 2014 MRS Fall Meeting in Boston, Massachusetts, USA and 2015 E-MRS Fall Meeting in Warsaw, Poland. 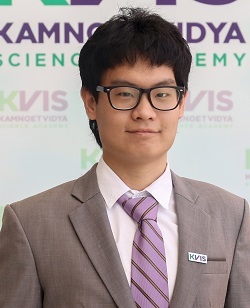 After joining the KVIS chemistry team as a chemistry and earth science teacher at the end of 2015, Dr. Suranan Anantachaisilp received an opportunity to undertake a professional development under teacher exchange program at the Department of Chemistry, Korea Science Academy of KAIST in Busan, South Korea in Spring semester 2017.
teaching in Trang, before moving to Phuket in order to teach Science at Kajonkietsuksa English Program (KS-EP). Originally employed as a Science teacher, she was quickly promoted to Science Co-ordinator, and later also held the roles of British Curriculum Co-ordinator and Humanities Co-ordinator. After three years in Kajonkietsuksa’s English Program she was asked to take on the role of Head of Secondary for KS-EP. 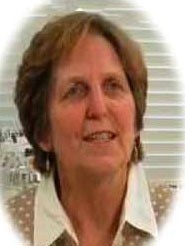 As the school had previously only had primary aged children, her role as Head of Secondary involved all aspects of school management; she had only five months to set-up the school ready for opening, and was highly successful in this role, raising student numbers from only 5 students in the first week, to 22 at the end of the first term and 58 students in the second year of operation. Her 10 years of teaching have gained her a great deal of experience, both through the variety of schools in which she has taught, but also through her range of roles and through the variety of subjects which she has taught; English, Biology, Chemistry, Physics, Geography, History, Travel and Tourism and Global perspectives. While teaching at KVIS she is also currently pursuing an MSc in Wildlife and Livestock management, online through the University of Glasgow in Scotland, UK. Arjaree Thirach was an outstanding student who won a Royal Thai Government Scholarship (ODOS) to study abroad from 2004 - 2011. She obtained her BSc in Life Sciences, majoring in Biochemistry, with distinction from Hogeschool van Arnhem en Nijmegen Univeristy in the Netherlands in 2009. She later went to Wageningen University and graduated with an MSc in Molecular Life Science. She participated in various research teams, such as physiological research with Radboud Nijmegen University and vaccine development research with Crucell N.V. company in the Netherlands. 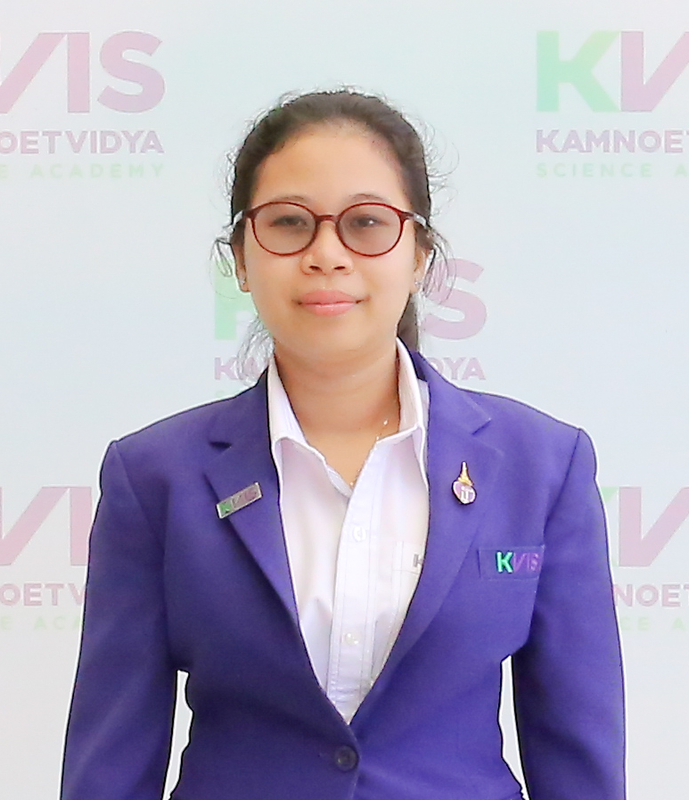 Before joining KVIS, Arjaree Thirach worked at Rajamangala University of Technology Lanna (RMULT) in Chiangmai where she taught Microbiology, Biology, and Biochemistry. She also has experience in biotechnology and food innovation research. In 2012, she was involved in cancer research at the Department of Biological Science and Technology at National Pingtung University of Science and Technology (NPUST) in Taiwan. In 2016, she took a part in a constructionism training program and the STEM Ambassador Training Program in order to learn pedagogy, with a view to enhancing her students’ lifelong learning skills. 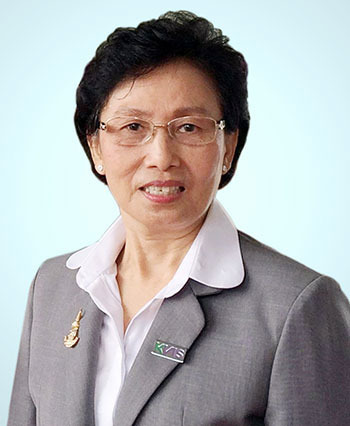 Siriporn Suntiworapong obtained her BSc in Biotechnology from King Mongkut’s Institute of Technology, Ladkrabang in 2012 and an MSc in Environmental Science from Kasetsart University in 2015. While studying for her master’s degree in 2013, she started her career as a research assistant on a training project for Monitoring of Microclimate and Air Pollutants in Thailand. This also involved cooperation with Chulalongkorn University. In 2014, Siriporn Suntiworapong attended the 19th Congress of the International Society for Human and Animal Mycology in Melbourne, Australia. 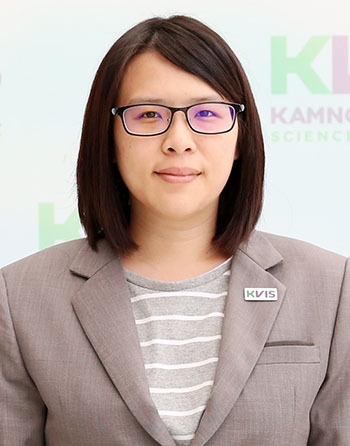 Accepting the challenging opportunity to work at KVIS as a Biology and Environmental Science Laboratory Technician in 2015, she has since received numerous great teaching experiences. 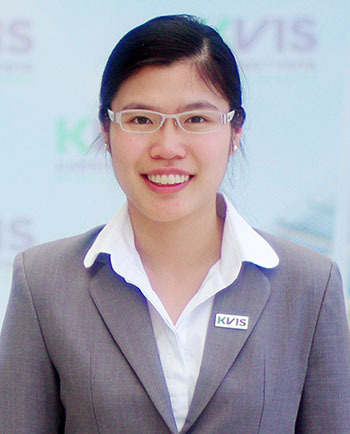 She also had opportunities provided by KVIS to broaden her perspectives. 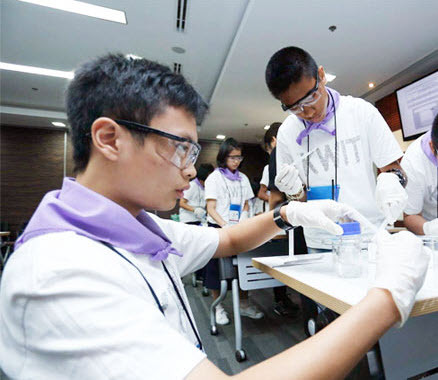 One of these is participation at the 2016 Asia-Pacific Forum for Science Talent “Problem Solving of Future Scientists” at the National Taiwan Normal University. 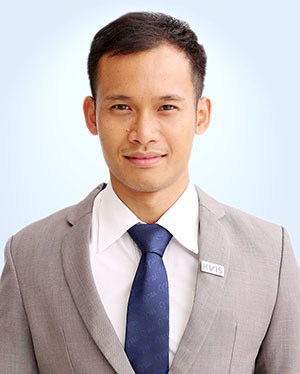 Warin Poomarin graduated with a BSc in Physics with First-Class Honours from Chiang Mai University in 2010, and an MSc in Engineering from Chulalongkorn University in 2015. He has worked as a research assistant and a machinery operator at the machinery workshop of the Faculty of Mechanical Engineering at Chulalongkorn University. He published in two international journals and received the best presentation award while pursuing his master’s degree. Warin Poomarin specialized in Computer Aided Design (CAD), Computer Aided Manufacturing (CAM) and 3D simulation. He has been using design skills to set rules and create visual simulations for many national competitions including the “IRDC: International Robot Design Contest” from 2012 to 2016 and “IDC RoboCon: International Design Contest” in 2016. These are venues where university students from around the world design robots to achieve tasks according to the rules. 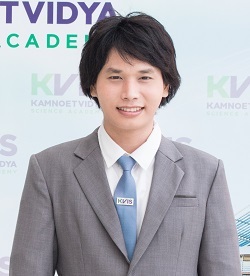 Warin Poomarin also participated in a film club where he used his knowledge of physics to help his team create multiple realistic simulations and media works. The club got through to the final round and won many awards in many competitions. His media works have been recognised internationally, leading to a period of working in Canada in 2014 at a film Production Company. 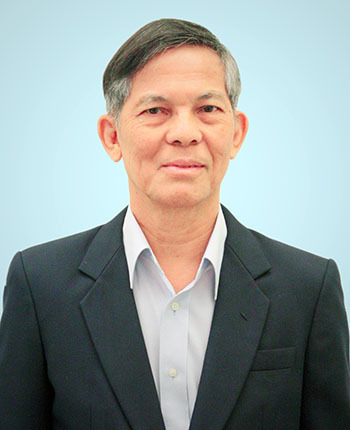 Dr. Supattanapong Dumrongrattana is a former assistant professor at the Department of Physics, Faculty of Science, King Mongkut’s University of Technology Thonburi. At the University he has been active in coordinating a project named “Work Integrated Learning”. 1. Postdoctoral researcher, Tampere University of Technology, Finland (02/2014 – 12/2014). 2. Research associate, KULeuven, Belgium (12/2012 – 05/2013). 3. Early stage researcher, Marie Curie initial training network, KULeuven, Belgium (12/2008 – 11/2011). 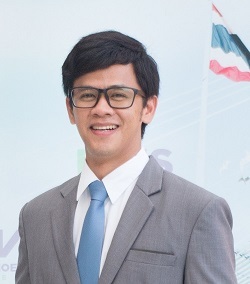 Theparak V. Palma received a full scholarship to pursue the area of his interest in electronics computer technology at Saint John’s Polytechnic school in Bangkok while he was studying at Saengtham College in Nakhon Pathom Province. He later graduated with a BA Humanity majoring in Philosophy in 1997. Theparak V. Palma also received a diploma of Vocational Education in Industrial Technology after a further 2 years of study. Theparak V. Palma went to the USA in 2001, where he worked in various part-time jobs and also studied at the Cleveland Institute of Electronics (CIE) in California. He was granted a Diploma of Electronics Technology in 2004. During this time, he received valuable experience working as a communication system technician at Advanced Digital Communication from 2003 to 2005. Theparak V. Palma returned to Thailand in 2006 and set up his own business providing a microcontroller training program to both high school teachers and university students. 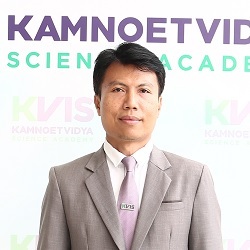 Six years later, he was appointed as a teacher of Computer science and a project advisor of students’ science projects focusing on robotics, environment and energy at Chaophraya Wittayakom School. These projects received awards in many competitions. He also worked as a technical consultant on a project dealing with electric safety equipment among private sector representatives, and teachers at Rajamangala University of Technology Thanyaburi. 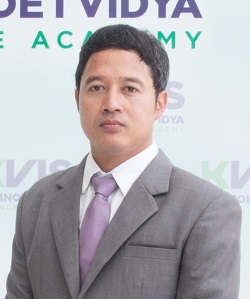 Theparak V. Palma joined KVIS in January 2015, working as both the physics laboratory technician as well as teaching a course on Basic Engineering, Design & Technology. He is also a co-advisor of KVIS students’ science projects involving robotics and microcontrollers. 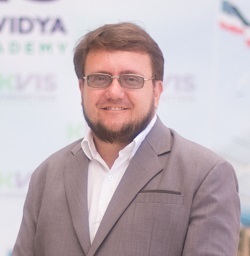 During the course of his teaching career, he has earned skills in creative teaching techniques that allow him to motivate students and enrich their learning. Secondary Education with honors, majoring in English, from the Faculty of Education at Chulalongkorn University in 2008. During practice teaching, she was awarded the outstanding English student teacher award from her faculty for the 2008 academic year. 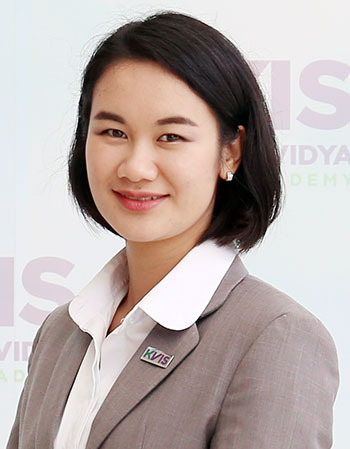 She later obtained her MEd in Teaching English as a Foreign Language from the International Program of the Faculty of Education at Chulalongkorn University with a 4.00 GPA in 2013 and her research was presented at the 34th Thailand TESOL International Conference in 2014. During her master’s studies, she served as a teaching assistant in the Teaching English as a Foreign Languages program at her faculty from 2011-2013 to help delivering lectures to undergraduate students from the faculty of Education and assisting in curriculum development and teaching. She had her previous experience as an English teacher and tutor in famous high schools and international schools. She is often invited to be a guest lecturer and tutor in many projects. 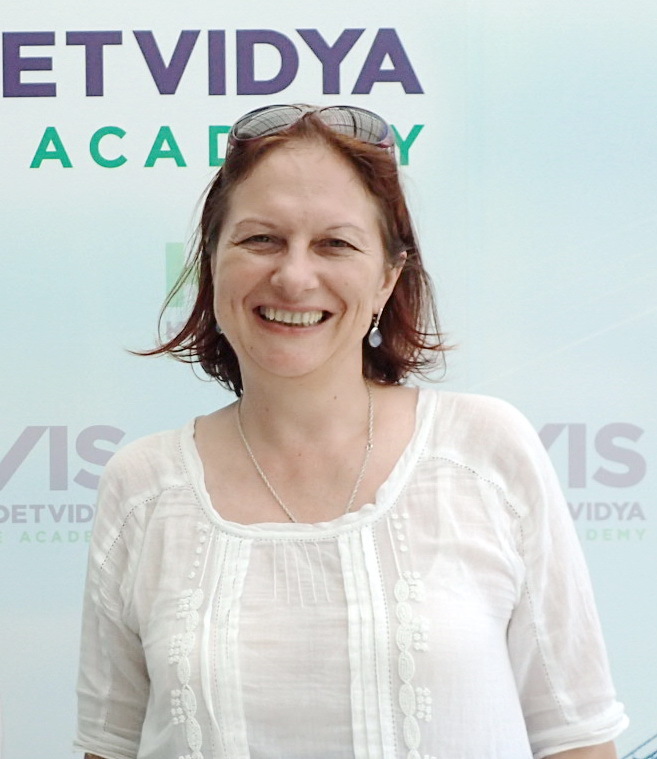 Sophia Arwae started working at KVIS as an English teacher and as one of the pioneer teachers in June 2014. 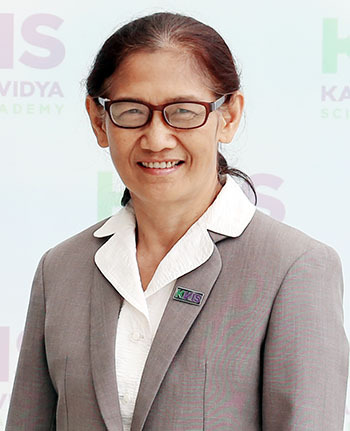 In 2015, she received valuable special training advancing her international knowledge and pedagogical techniques funded by the Rayong Science Academy (RASA) Foundation; she attended a 3-month educational training program at Fontys University of Applied Science Venlo Campus in the Netherlands. 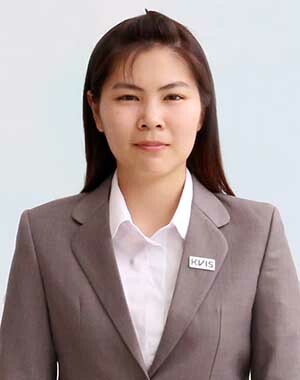 Furthermore, she was selected to be a representative for the KVIS English teacher exchange with Gyeongggi Science High School for the Gifted in South Korea in March 2016, broadening her horizons and developing her knowledge of teaching gifted students. In addition, she has recently presented her active research about materials development for high-ability students at the 63rd TEFLIN International Conference at Surabaya, Indonesia, in September 2016. 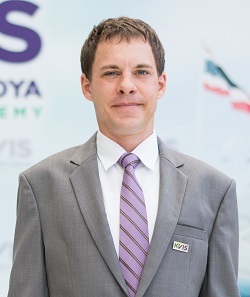 After graduating from Willamette University (Salem, Oregon, USA) in 2004 with a bachelor’s degree in environmental science, Kristopher Lee Kraus moved to Washington, DC and spent eight years synthesizing technical literature and other input from leading Earth system science experts to create lay-friendly publications relevant to policy development and institutional reform. 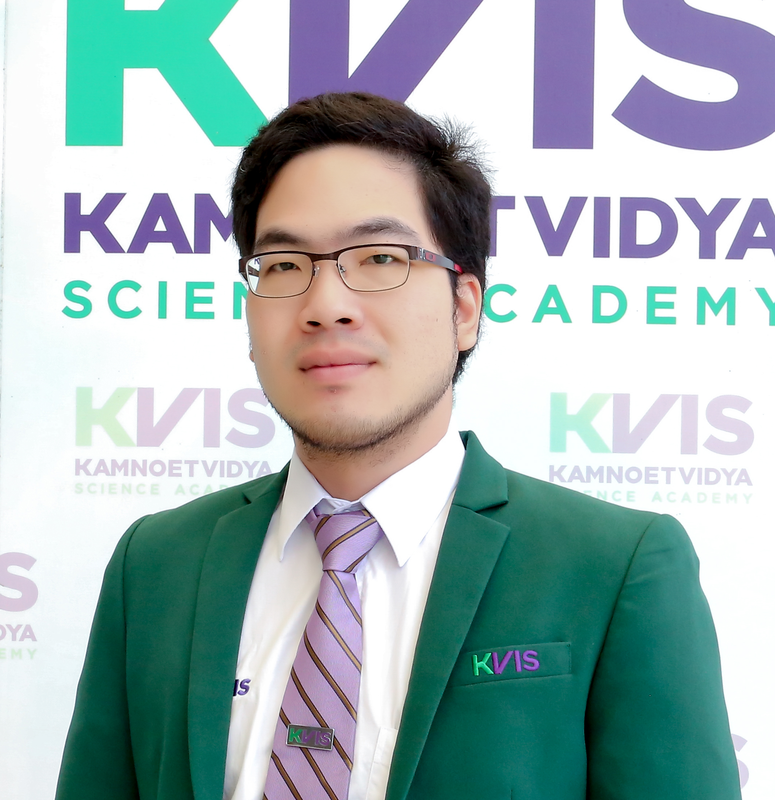 With this background in science communication and education, Kristopher began his teaching career in Thailand in 2013 and currently focuses on teaching writing to M5 students. Johan Marais has substantial experience in Finance and Education. While working for 13 years as a financial analyst and accounts manager for the largest bank in Africa, he managed a variety of portfolios in the Agric, SME and Commercial markets. In 2011, he became a teacher and has since worked ceaselessly to promote the development of his students. He obtained his B.Com in Business Management from the University of South Africa, his teaching qualification from The Commonwealth Education Trust and holds 44 MOOC certificates and diplomas in various subject fields. As a MOOC specialist, he has also been employed by Coursera as a mentor since 2015. 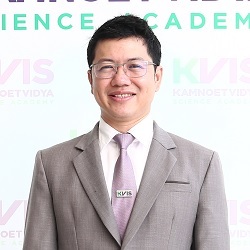 Chaleosri Pibulchol, a former associate professor and Dean of Humanities at Srinakharinwirot University, has been assisting KVIS since the early stages of its development. She has extensive expertise in Teaching English as a Second Language and used to serve as the president of Thailand TESOL Organization. 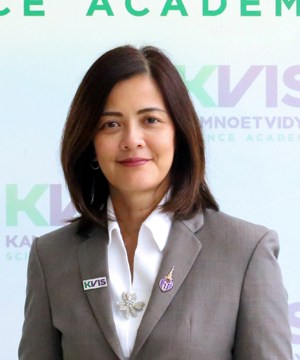 Dr. Absorn Meesing, a highly experienced instructor at Assumption University and a former headmistress of International School Bangkok (ISB), has been with KVIS since its genesis. She used to assist Thai Ministry of Education as a curriculum developer. 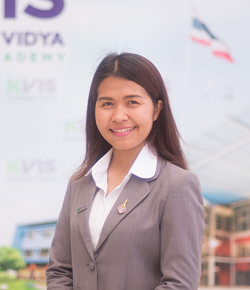 She has been assisting KVIS greatly by inviting foreign experts to share knowledge with KVIS students and staff members. Yi-Hui Wu received a BA with double majors in “Teaching Chinese as a Second Language” and “Chinese Language and Literature” from the Department of Applied Chinese Language and Literature, College of International Studies and Education for Overseas Chinese and the Department of Chinese, College of Liberal Arts at the National Taiwan Normal University (NTNU) in 2013. The University specializes in Education, training teachers for every field. 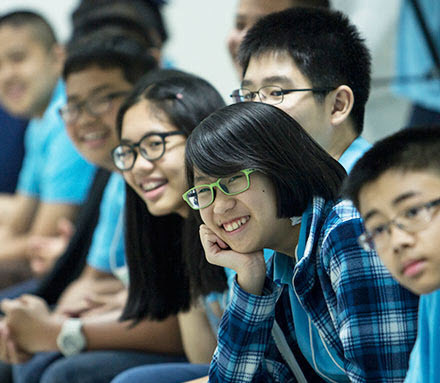 As a Chinese teacher at KVIS, she teaches not only language, but also Chinese culture. She was well-trained during her five years in University, and received an internship for teaching Chinese in the Philippines in 2010. She received her certification as a Chinese teacher in 2014, issued by the Ministry of Education, Taiwan. In 2015, she taught both English and Chinese in a junior high school in Taiwan. She was later chosen by the Taiwanese government to join the foreign languages team as a Chinese teacher at KVIS in May 2016. Malaysian-born Jane Kanjanaphoomin obtained her bachelor’s degree in Business Studies (B.B.S), majoring in Finance from Massey University, New Zealand. Upon graduation in 1990, she was employed as a Financial Analyst at Hewlett-Packard Singapore. Jane has extensive experience in the private sector; in the fields of media, banking, and business development, where she has held positions as Editor-in-Chief to Vice President of the Chairman’s Office, Nation Multimedia Group. In 2004, Jane found her vocation in teaching, graduating with a Master’s of Arts in English Language Teaching (MA-ELT), Distinction Award from Assumption University, Thailand. She was the school’s first recipient to be proudly awarded for academic excellence. In 2011, she obtained her Ph.D., completing her Doctor in Philosophy from the Graduate School of Education, Assumption University. Her overall GPA of 4.00 saw her once again honored with a Distinction, and her Ph.D. dissertation was on “Teacher Leadership Framework for Gifted Education in Thailand”. 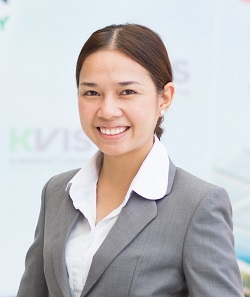 Jane joined KVIS in May 2017. Prior to that, Jane was a specialist teacher of English at Mahidol Wittayanusorn School (MWITS), having taught at the country’s national gifted school of mathematics and science for over seven years. Known for her dedication, high commitment and positive personalities, Jane also received the “Best Teacher Award in 2011” in recognition of her exemplary teaching methods, contributions to professional learning community and professional development. Her expertise lies in teaching critical and creative thinking skills, English for Specific Purposes, IELTS and TOEFL-ibt. She also has more than six years of experience advising students on college and scholarship essays to well-known international universities, and held interview simulations for both local and overseas universities. In community outreach programs, she has served as a trainer for English teachers for “Train the Trainers” projects for the 12 Princess Chulabhorn Regional Colleges in Thailand, and recently in 2017, for the “Pracharaj Schools”. Jane is also an avid reader and an active sportsperson. 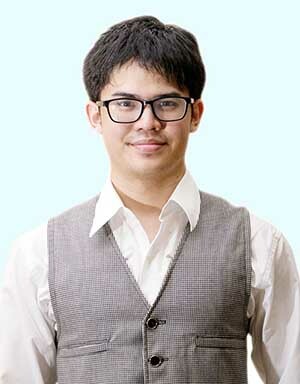 Weeraorn Imjai has an educational background in Thai language and journalism. She graduated from her BSc in Thai language, with honors from the Faculty of Liberal Arts at Thammasart University (TU) in 2009 and later a master’s degree in 2013. While working on her dissertation, she gained teaching experience as a special instructor of Thai usage for students in the Faculty of Engineering, Faculty of Science and Technology and Faculty of Public-Health. Promotion of reading, for developing reading skills and reading habits for teachers and students in elementary and high school level was also a major activity of her work at. 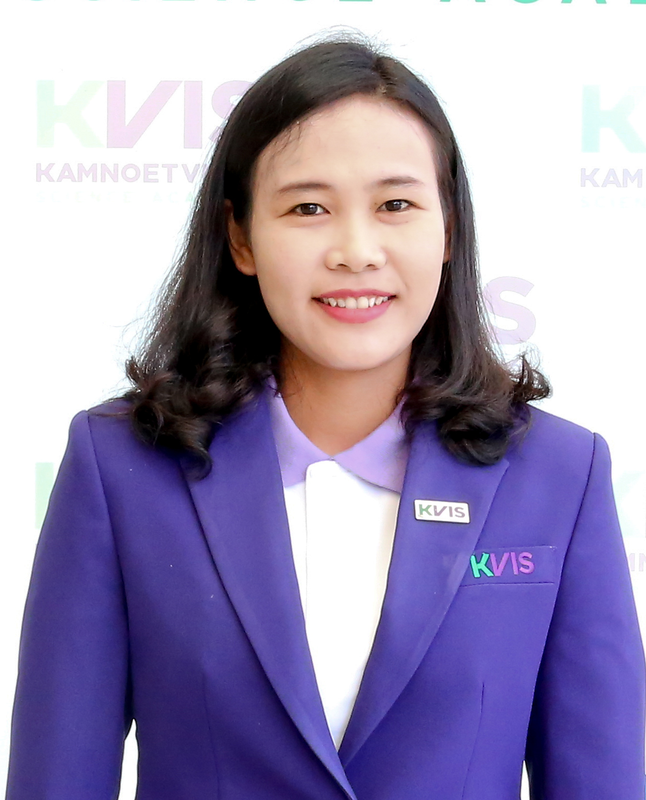 She has also worked as a member of the editorial staff in Kor-Kon magazine at TV Burabha and as a tutor for Thai language. 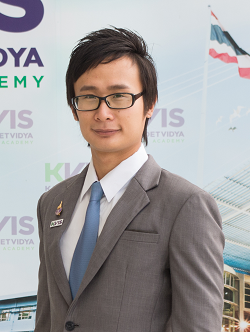 After graduation, Weeraorn Imjai became one of the group of pioneer teachers at KVIS during its earliest days. She had an opportunity to go abroad under a three-month professional development program for teachers at the University of Arkansas at Little Rock (UALR). During this time, she gathered experiences, conducting research with the professors at UALR and joining educational conferences in the United States. 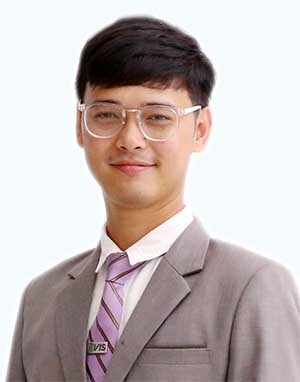 Thitiphat Jaroonchaikuljaroen received a full scholarship for his bachelor’s degree in Thai, from the Faculty of Arts at Chulalongkorn University, graduating with honours in 2010. He later received an MLitt with honors in Ethnology and Folklore from the University of Aberdeen in the UK in 2013. He gained some work experience, teaching Thai for 1 semester at Chonkanyanukul school in Chonburi before moving to the UK to start his master’s degree. While studying abroad, he taught Thai language and culture to Scottish people. 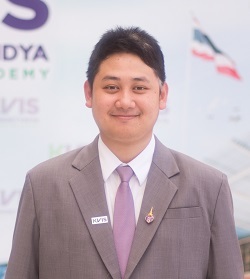 After finishing his master’s, he came back to Thailand, working as a Thai teacher at Mahidol Wittayanusorn School, the first science high school for gifted students of Thailand. He has a special interest in Thai literature and cultural studies and anthropology. 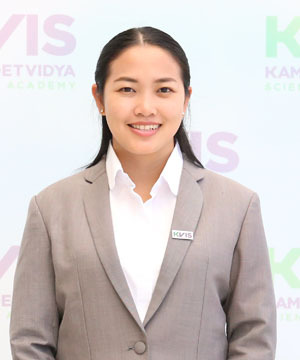 Dr. Gidja Tanomsingha graduated with a BSc in Sports Science and Technology in 2009, and an MSc in Health Promotion Science in 2011, before graduating with a PhD in Physical and Health Education from Chulalongkorn University in 2015. While studying for his master’s and doctorate degrees, he worked as a professional trainer at AIA head office fitness center and also at Bangkok Commercial Asset Management (BAM), training his students to be healthy and happy. 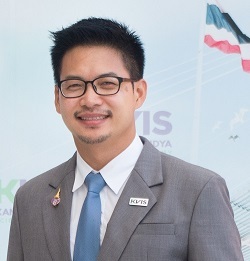 During the same period, every month between July 2011 and March 2015, he also worked as a lecturer for the class “Good shape with Thai boxing” as part of the Chulalongkorn University Values Integration Program (CU-VIP). He worked as an athletics coach for The Thai Red Cross Society while he was studying for his bachelor’s degree until December 2015. Moreover, he taught the popular rhythm class, from the beginners’ level up to Social Dance in the faculty of Sports Science at Chulalongkorn University in July 2008 to April 2015. In addition, he was also a boxing coach assistant for the Boxing Club of Chulalongkorn University in the Thailand University Games 43rd “Kankrao Games” in January 2015.